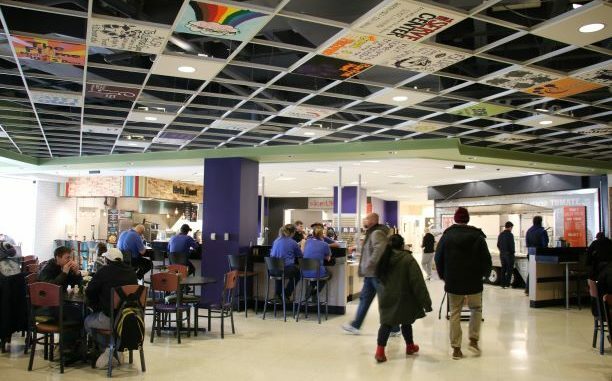 Among other changes, Sodexo is shifting campus dining hours in response to a falling budget. With the addition of the new dining option of Einstein Bros. Bagels, the hours of operation and dining options for some places have changed. Sodexo General Manager Justin Dreslinski said the start of the semester has been busy for the main food provider on campus. Einstein Bros. generated over $10,000 in revenue in the first four days while workers were learning how to operate the new business. Dreslinski said the learning curve caused students to experience some longer wait times. Einstein Bros. is also now the only breakfast option available in the Student Union Building, open 7 a.m. to 7 p.m. Monday through Friday. While Einstein Bros. is not open on weekends, the campus Starbucks is now open on Saturdays from 11 a.m. to 5 p.m. Dreslinski said he thinks this change will drive more traffic in the library and students will be happier with a closer snack and coffee option. Einstein Bros. has been accepting comment cards since it opened, and Dreslinski said most regard the shorter hours of Mainstreet Market in the SUB. Mainstreet Market is now open at 10:15 a.m. weekdays, but Chick-fil-A, Mein Bowl, Slice of Life and Tres Habaneros don’t start serving until 10:30 a.m. Dreslinski said this decision was made in part because of a lack of traffic to Mainstreet Market in the morning, the cost of keeping it open and the breakfast menu available at Einstein Bros. all day. Dreslinski said the minimum wage increase passed by Missouri voters last fall, combined with a decreased enrollment at Truman State University, means higher costs and less income from student meal plans. He said this semester there are about 350 fewer students on meal plans, which makes the difference between opening Mainstreet Market in the morning and being forced to close. “Labor cost is the number one expense, and when we were looking at usage numbers for people coming through the Student Union [Building] for breakfast, it wasn’t utilized as much as the other operations on campus,” Dreslinski said. Dining halls are still open for breakfast, and Sodexo will continue its $5 Friday promotion and premium nights throughout the semester. Every dining hall also now features an updated deli section, making toasted sandwiches available in every hall. Bodacious Burgers and Wicked Wings will also continue to operate alternating Wednesdays throughout the semester, and Dreslinski said he is looking at possibly adding a third specialty concept focusing on mac and cheese next semester. Next year, Sodexo is looking at changing on-campus meal plans and opening a dining hall on Sunday nights. Dreslinski said the budget is a driving factor in planning for the future. He said the food service sales are not as high as they were last year and he expects a revenue loss of about $700,000. Dreslinski said he would be interested in creating a survey later in the semester to learn more about what students and faculty are thinking about their dining experiences on campus. Ryan Pivoney is a sophomore communication major and Managing Editor at Truman Media Network.